Notes: This is a new grappa to the market produced by a fouth generation distiller with a passion for perfection. Distilled in a copper pot still in small batches from Muscat grape pomace. They also produce an excellent Rye Vodka, Orange Liqueur, Lime Liquor, and Mead. Appearance: Crystal clear, no sediment whatsoever, or separation. Nice body to it. On swirling, it leaves a a thin clear coat on the inside of the glass, legs forming after a bit. First Impression: Flowery muscat aroma with briny notes to it. Taste: Grapes, buttery almonds, saltwater taffy, stony, mineral quality to it – quicksilver feel on the tongue. Appropriate amount of heat to the finish. Drinks: Of course my Sicilian friends (especially the older ones) have this with their morning coffee before hunting (or a lot of other mornings too). Cigars: Parodi – What else would you have grappa with? B: One of the cheap mass produced grappas that was shipped over here because no one in Italy would drink it. C: Some of the American attempts. For an American-made grappa, this is outstanding. Most of the field I would not use to remove the tar from my car. This, on the other hand, has proven that properly made grappa here in America is a excellent alternative to the expensive boutique type imported from Italy – something I would not have thought possible before trying this. 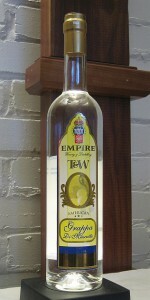 Bottle: Distinctive, tall, clear glass bottle with simple paper labels and gold neck wrap. Good quality cork stopper completes the package. Relatively fast loading, large amount of information. Easy-to-read. Goodcontent and descriptions of products and production.